My wee brain is very slow to start in the mornings. Typing is not easy. Neither is thinking. 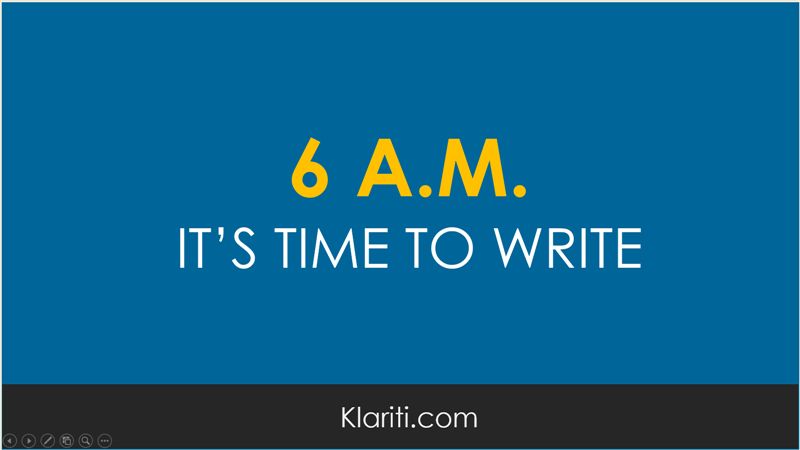 So, how do you start to write first thing in the morning. Decide on a specific target, say 100 words. Identify the topic the night before. The will work away in the background while you sleep. Don’t worry about spelling. Editing is later. Write short sentences. You can fill them out later. Do this for 10 minutes, then walk away, get a coffee and know that you’ve started. Add extra supporting sentences here and there. Include more information to build the article, blog post, or report you’re working on. This works for me because I tend to write in passes (i.e. phases). In each pass, I add more and build one layer upon the other. I can’t write the entire piece from scratch. Or, if I try, what’s delivered tends to be a ramble, without much cohesion, that needs lots of editing. It’s 6.30 am now and I need to go to work. Let me know how you write first thing in the morning.